This morning NHL woke up. One of the first things he said to me was that it was President Barack Obama’s birthday today. Yes, my almost six year old son knew that the President’s birthday is today. You may be asking yourself, how or why he knows this fact or several others about United States Presidents that he rattled off to Nana and Papa last night? The answer is mainly that he loves to learn. When he hears something, he sets it to memory. Just like his Daddy had when little, NHL has a some what photographic memory. 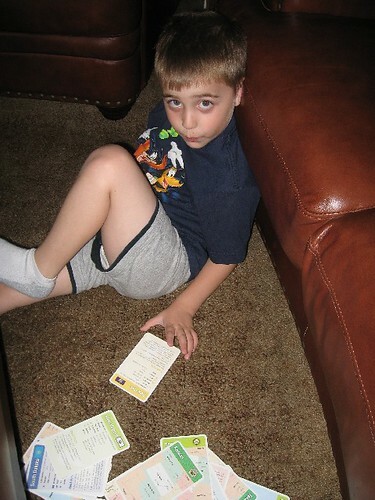 Of course, the real answer is that we bought sets of U.S. Presidents flash cards and ones of the United States. Nana found them at Target in the dollar bins as you walk in. NHL loved them so much while visiting her a few weeks back that I went and looked for them. As a teacher, I love having as many educational and fun things around the house. Sunday JL and NHL decided to look at the U.S. Presidents cards. They sat there for quite some time reading about each of the presidents. JL noticed that President Obama’s birthday was the day after his. NHL recalled this and as you know said it first thing this morning. Last night he was even able to tell Nana several other facts about more distant presidents. While NHL was playing with the cards at my parent’s house he asked me which presidents were around during my life. I knew most of them. What I did not realize was there was one other. Since I was a December baby born after an election I was technically born during the Ford administration. Sad that I never really thought about that, but I always remember Carter being mentioned when I was older and never thought about when he was sworn in. 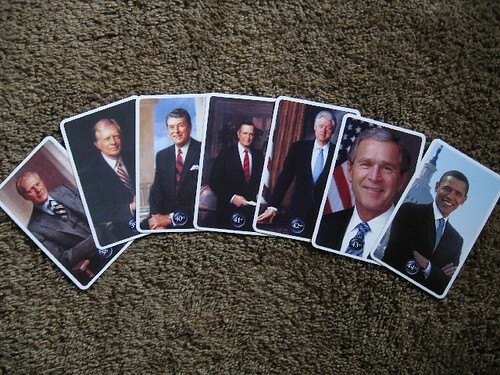 To answer NHL’s question I quickly pulled out all of the cards for the presidents and showed them to him. Then we talked about the two presidents during his life and how there will be many more to come. Anyone else notice how different #43’s photo is compared to the rest? I thought it was odd how his was a close-up shot rather than the more traditional portraits. I’m assuming the current president’s photo was a quick one they used to get this product out fast. Yesterday while on the way to drop the boys off to Nana and Papa (we were going out to have dinner for JL’s birthday), JL asked NHL how old he thought he was. NHL guessed 31. When JL told him he was 34, NHL immediately said "Oh, so next year you can run for President Daddy!" So there you have it ladies and gentlemen, TechyDad will be running for president in the not too distant future – LOL! So what kind of fun educational items do you have/use with your children or did you love when you were a child? Please let me know in the comments because inquiring minds would love to know. We’re still on the young side of things (25 months) but we do have matching puzzles (this is blue, what else is blue? and such) thus far. Our girl is more interested in regular puzzles and playing with her Little People, but pulls out the matching game every few days. The $1 Menu at Target is wonderful. We saw that set, but opted for the Animals of North America for our big road trip last week. You can never lose with animals in our house! This should keep both of the kiddos happy along with the Presidents and U.S. States. What a smart and clever boy! The magnetic letters have been good to us. My kids were all the same way, and it’s great! My son however is the only one with a photographic memory. I swear that kid is a sponge. One word of warning? lol. These type of kids get very discouraged when they don’t pick something up right away (when they’re alittle older than your son now). So watch out for that it’s frustrating. :) I don’t know how your son is but mine didn’t want any real help…he ‘needed’ to figure it out on his own. Good for you though….he should have a really great school life! I love these cards from Target! We have them, too, and my daughter loves going through them. As for the difference in pictures, it’s because W & Obama don’t have official portraits yet. W may now, but these were likely printed while he was still in office when a photo is used.